I don't know how else to put this, but DAZ Studio 4 is horrible. Whoever decided it would be a good idea to scrap the intuitive interface of DAZ Studio 3 needs to have their position in the company re-evaluated. As an artist, I am befuddled by the extreme difficulty of even getting the hang of the interface. The interface is counter-intuitive and often disruptive to my focus and what I want to do. Just to set the camera at an angle, I have to reach all the way over across the screen. Just to pose the figure, I have to reach to another part of the screen to click on a tab and run through a barrage of totally consummate options that simply do not get to the point. I imagine many other users are having serious complications with DAZ Studio 4's interface as well. Would it hurt to bring back the old interface as an option, at the very least? For the record, as a user of DAZ Studio since 2005, I absolutely refuse to use DAZ Studio 4. I have reverted to DAZ Studio 3 and I will stay with it. If it inhibits me from buying plugins, so be it. You could the darkside and citylimits combo that gives you almost the exact same layout but with the added capabilities. I've been a studio user since 2005 and I can't even make my self start up cludgy old 3 any more. Different strokes for different folks. DS4 is almost completely customisable, and as Khory says, try some of the other layouts. There is no need to use all of the various tabs along the top, like Shaping and Posing etc, if you are familiar with DS at all. My intercae looks very like DS3, I have Content Library, Scene and Surfaces on one side, and Parameters, and Pupeteer on the other. It is very easy to use, and I would not go back to DS3 although I still have it installed. Have a look at sorting out the UI to your own needs, you can have DS4 and DS3 on the same machine with no problems. I am using city limits layout too. And I have used almost all the previous versions of DS. I really like the new interface. Nothing wrong with 4 IMO, it took me a few hours to re-adjust. I wouldnt say the UI is particularly worse or better that DS 3 - just different. Id argue that getting used to the new UI is small price to pay for all the new toys it offers. Well, I am IN 4.5 and using a layout that pretty much looks like 3 anyway. I'll take the new bells and whistles but leave the old layout. DAZ heard people upset about the interface and made a customizable option that looks like it., I would suggest upgrading and trying it out. I have come to terms with the new interface. Although that just means I almost completely replicated my old DS3 interface. Still, every time I start up DS3 I am delighted by the speed of the old interface. DS4 just feels like your doing everything with a big ball of iron tied around your ankle. So I would agree that DS3 is much better, but regarding just layout, there doesn't need to be much of a difference if you're willing to spend a few minutes to customize everything. I did notice a difference in speed between 4 and 4.5 which seems faster. Also, if you tell DAZ not to load Genesis automatically MAN does THAT speed it up. I have both versions, Ds3 and the 4.x.x.6 whatever it finishes, take a long way to get along with Ds4, but it's worth the time, try again. Well I agree with you there except I have no problem with daz 4.0, but I have had ton of issues with later daz like daz 4.5. You talk about counter productive man I have never seen a proogram so set on wasting time. I have upgraded twice to 4.5 only to have to down grade back to 4.0 becuase of major bugs in the program. I have asked and asked for months now to fix some of these problem that have become abundantly clear that a lot of people are having the same issues only to have the people at daz say that the problem pretty much isn't big enough. Oh well I guess. Wow... I have had the exact opposite happen to me. The community steered me in the right direction and came to my aid and 4.5 works like a dream for me. Quicker response time and everything. What were your issues, shadowl? You all say that the interface is customizable in DAZ Studio 4. That alone gives me hope. But is the option available in the free edition, or must I upgrade to the advanced edition to have it? If it's not available in the free edition, DAZ is making a big mistake. People who evaluate the software and try the free edition will probably lose their focus and scurry away from it like I have, lol. I thank you all for your feedback. All versions are free. You don't get decimator and something else with the free pro but pretty much everything else is. Be sure to download darkside if it is still a separate download. In 4.5 the Darkside is included, no separate download needed. The two plugins not included are Decimator and Animate2 (you get 30 days of full function in Animate2, then it drops back to 'Lite'...which means a few less options and more basic controls. Animations still work). Just organize your DS4 UI like your DS3 UI and you should be fine. ALso use the Darkside theme. ps, DS4 Pro is free. DAZ company now sells only one version of DAZ Studio, and that is DAZ Studio Pro 4.5, and it is FREE. This is the version that used to be the most advanced and most expensive one (there was free version, then Advanced, and Pro - now there is only Pro and everyone can get it for free). Look into the store, there is also Bryce 7 (for landscapes) and Hexagon (for modelling), both for free. Make sure that you "buy" all those free software from the store, so that you will have them in your account´s download history, and if DAZ ever decides that they will not be free anymore, you will still be eligible for getting upgrades. I got the quick response time and all it works for the most part except saving morphs and puppeeteer seems to be broken as well, I was able to do my work on a figure use morphs save it as a scene and call it good, i could then go back and continue working on it when I got the time. Now I work on a model do my morphs save it and when I load it back up all the morphs are gone and its like I didn't even make any changes. Yes everything is up to date, is there a speficfic folder im supposed to save it too or something other than the original one. 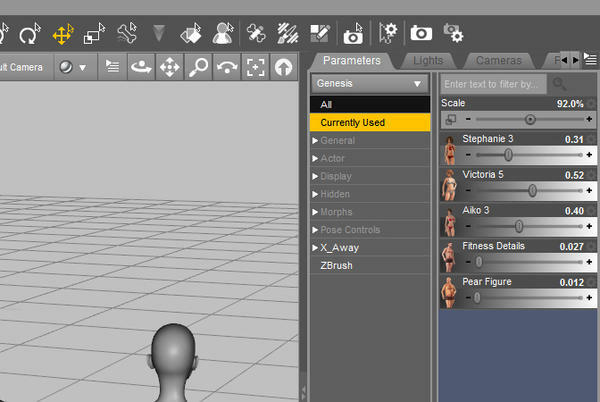 Becuase I have spent hours trying to figur out how to save my character with the morphs and my puppeeteer settings. They just need to make it more user freindly I hope you don't have to jump through hoops just to save the dang scene. I just tried this. I loaded genesis, morphed to the Hulk shape, clothed with Journeyer Scout, opened Pupeteer and used four different poses. I tried the Pupeteer Preview, and all worked well. I then saved the scene into my Scenes folder inside My Library, and then exited DS4.5. I reloaded DS, opened the saved Scene from the Content Library tab by double clicking, and it opened exactly as I had left it. The pupeteer dots still work as they were left in Preview mode, and all was as I expected. I am using DS 4.5.1.6, and I don't see any problems at all. I simply used the Save As > Scene.., and it worked. What version are you using, how are you saving, and how are you loading? I am using the newest version the one you have, I have an idea save yours without the preview and see if it works I bet it doesn't. In which case its broken, I've talked to quite a few freinds and others that are having this problem so I know its not just me, there is something broken or the duf stuff isn't fully compatible yet. I have updated everything to the newest version so I know I haven't messed up the save scene file is where its supposed to be to. Sorry it took me so long to get back to you but I have scenes I've started on from when I first upgraded saved safe and sound. My only problem was crashing on render which seems to be solved now, thankfully. Can you be a LOT more specific about the figure you are using (i.e. Genesis, M$, etc), the exact morphs you are using, and how exactly yuou are saving it? (Save Scene, Scene Subset, etc)? I just tried this with Genesis again, morphed to a bit of V3, A3 and Jasmin, created four Pupeteer spots from the Poses folder for Genesis, saved as a Scene (.DUF), and when it loaded, it was exactly the same as I left it. I had not tried the Preview in the Pupeteer, just saved it in Edit, and when I tried preview after reloading the Scene, all worked as expected. Sorry, I can't get it to break, with Genesis at least. As RKane says, can you tell us what figure and morphs you are using, so that we can try and replicate this behaviour? Can you do what i just described above with Genesis without an error? Ok for starters there is no error message like I have sad it loads just fine fast even I can load cloths and do everything else. I don't know how to explain it any simpler. Here it goes, I load genesis the updated version duf one I dial in vic 5 aiko 4 and 3. Use the muscle morph for instance and the body tone dial. I then go to puppeteer make a little dot revert everyhing back to where there no muscle or tone dial make another dot. Click on the previous one it shows the muscle click on the second it reverts to original. I then save the scene as (DUF) make new scene reload it. Click on first dot shows normal figure click on second dot same thing the morphs I used don't save and they are updated. Again like I said I am not the only one with this problem, so whats the issue becuase I am saving in daz4 folder scenes and it is in duf format. Everything works except puppeteer. Oh by the way just got an e mail confirming that there is a problem with that part of the program from daz as I was typing this out. Yes, I see in Mantis that it has been fixed in a future version. I did not use Elf Ears or Muscle tone in any of my tests. I will try it now, but I expect it to fail. Yes, the Elf Ears test for Pupeteer fails for me as well, but the body shapes work the same as I saved them. It must work OK for FBMs but not some of the other morphs - well it is fixed and should be available shortly. Thats my problem but none of my morphs work at all, I got fed up yesterday and did a system wide cleanup of daz got rid of everything took 1 hour to get rid of stuff about 60 gigs worth. Reinstalled the stuff I use the most of and guess what still doesn't work, I am using the latest daz they have out plus all the updated plugins and morphs they have. There is no other daz folder to save stuff too like before I had folders from back in the daz 3 days, got rid of all those so I made sure the program wouldn't get confused as to where it needed to save. I did manage to get rid of another problem I was having while doing this the dang duplicate ids where found message is gone now. If anyone knows of any way to fix this it would be greatly appreciated if you told me becuase I'm about bald now from this. Pretty much have to start from scratch now so the past months work gone. I tried this again with Genesis, a mix of V5, A3 etc, but this time I used Fitness and Pear Shape. I did not alter the actual pose at all, but had a dot in Pupeteer for the first body shape as above (in the T pose), then added the Fitness and Pear Shape, added another dot to Pupeteer, tested it in Preview, then saved it as a Scene. When I loaded the Scene, it looked like the first dot in Pupeteer, but when I used Preview, nothing happened, so it does the same for me. The image below shows that the sliders are not set to the correct value when reloaded, I think Fitness was saved at 100%, and the Pear Shape at about 40%. If I try to move these sliders, they work OK, but they come in from the saved scene at the wrong values, so Pupeteer does nothing. Hopefully that has been fixed too, and is a similar problem to the Elf Ears, and it will be coming along in the updated version. I am sorry I didn't try that earlier, but better late than never. Just have to add that Daz 4.5 has been horrible horrible horrible and a complete and utter waste of time. Just freezes up...ALL THE TIME FOR NO REASON. I made the terrible mistake of re joining the platinum club and buying a load of Genesis products to the tune of 150 dollars on the theory that maybe by 4.5 they would have fixed the complete and utter mess that was the disaster of the earlier versions of 4. Granted...that was my own fault Daz has (as usual) played me for a sucker. Giving away a shiny toy that doesn't work and selling a bunch of useless junk to go with it. After hours and of reading about how to install content then re installing the program and the content itself a couple of times just on spec it STILL does not work in even the most basic and primitive fashion. I can't set up simple scene or create a figure without it freezing up. I did make a post about this in another thread and got a fairly pointless reply that didn't help. I am so very glad I kept Daz 3 on my system because it still works just fine. whenever I am using 3 I keep thinking that it was never broken so why the idiotic decision to fix it? I've been using Daz and earlier versions of Poser since 2004 or so and more recently Carrara 7 Pro and I have a massive collection of content so I do know what I'm doing as far as being a user is concerned. I never wanted to know *how* the damn thing worked. Just that it actually did what it was supposed to do. So now, I'm just saving up to buy Poser 2012 since rumour has it that it is a program that actually *works*. I wish I had that 150 bucks back I wasted on the Genesis content. If you bought it within 30 days you can return it. ETA: According to your prior post, DS3 was also misbehaving. Is it working properly now? Do you know what was causing the problem?